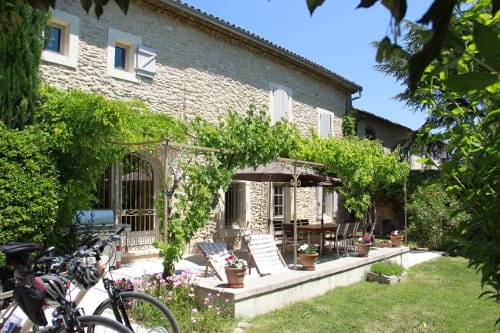 Enjoy our hosted, self-guided Provence bike tours from our family-run, 17th Century stone Farmhouse B&B in the Luberon, Provence. We have been running our single-based Provence bike trips for the last 11 years, and have had a 5* rating on TripAdvisor for all of that time, along with a 100% recommendation rate. Our cycling holidays are small scale, with no more than 8 bikers, so we are able to give you an individual personalised service, thus making sure you get the best experience possible cycling in Provence. We live here all year round, so we have lots of local knowledge. And we use this to guide you along quiet, beautiful backroads, that will take you through picturesque landscapes, some beautiful lavender fields and on to the best sights; whether it be to an unknown pretty stone village, a favourite local restaurant, an authentic farmers' market or renowned vineyard. Our Provence bike trips are self-guided and flexible. And we are always happy to help you choose the right ride, distance and level of difficulty to suit you on a daily basis. And you ride at your pace, after all these are your cycling holidays! And you'll use our quality, brand new Trek hybrid bikes (Ebikes or Road bikes available on request) & the latest, easy to use, stress-free Garmin GPS systems, preprogrammed with all of our most popular rides, for all levels. 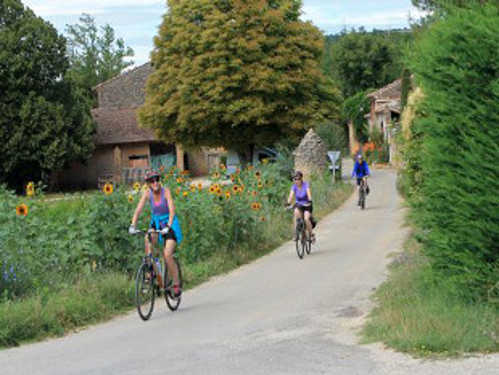 Click HERE to read more about What's Included in our Provence Bike Tours. Spending our week at Neil and Nat's single base B&B was the absolute highlight of our holiday. The experience was incredible, and the cycling was some of the best I have seen. 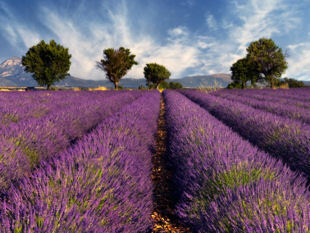 Neil knows his stuff and has spent years fine tuning the best routes for his clients to see the very best of Provence. I am already planning my next trip and have recommended this experience to at least 5 other people and I've only been back for a couple of weeks! Claire - Australia - Sept 18 - Provence bike tour review. Had a great time biking in Provence from Neil and Nat's B&B, they were wonderful hosts. He knows how to get you to your destination via gentle hills or the hard way. And he's a devil in the kitchen. The meals he prepared were fantastic. 94% 5-star reviews says it all. A votre santé et merci beaucoup!! Mike - US - June 18 - Provence bike tour review. The towns we visited were nothing short of breath taking. My favourites were Rousillon and Gordes. On the ride there the lavender fields were in full bloom so we stopped to breath in the beautiful scent that filled the air. I would recommend Provence Cycling Holidays to anyone interested in doing a bike tour of this spectacular region of France. Danila - Canada - June 18 - Provence bike tour review. 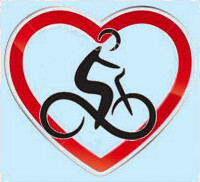 Neil has a wonderful system of bike trips all prepared for the little Garmin machines which you clip onto your bikes. Their farmhouse is within easy reach of all the pretty villages of the Luberon. The accommodation, the food and the swimming pool were all excellent and the little town of Coustellet was a perfect central point in the Luberon. Sally - Australia - June 17 - Provence bike tour review. Fantastic Cycling Tour in Provence!!! Every day we saw a different part of the Provence countryside. We biked through orchards, lovely vineyards and wineries and into charming hillside villages. We loved that we returned to the same spot each day to relax and then enjoy dinner at the B&B or pick a recommended restaurant for dinner nearby! If you are looking for a cycling vacation in Provence this is the one for you! Gregg - US - June 17 - Provence bike tour review. Guy & Ruth - Israel - June 17 - Provence bike tour review. Bonnie & Eric - US - Jul 16 - Provence bike tour review. Our experience with Neil and Nat's property and guest experience was extraordinary. There is no better way to sightsee a beautiful area than on a bicycle seat, and it's nice when all the routes and planning are so well laid out and easy to negotiate with GPS units. Hugh - UK - June 16 - Provence bike tour review. This was our second stay at Neil & Nat's farmhouse B&B. The hospitality was just as outstanding as before. I can highly recommend staying here. We had a lovely vacation. Mairi - Saudi - May 16 - Provence bike tour review. This is the easy way to stay in one location and go on all these amazing rides through beautiful lavender fields and rolling hills of grape vines and fabulous Centuries old homesteads. Even if you have not been on a bike for a long time you are looked after so well by the hosts Neil & Nat. Denise - Australia - Sept 15 - Provence bike tour review. A terrific week of biking and hospitality! We've been on 7 self-guided biking trips, and this is our favorite. John - US - June 15 - Provence bike tour review. We've just returned from nearly a month's wonderful vacation in France. We visited Paris, Provence and Cote d'Azur, but undoubtedly the highlight of the vacation was 6 days cycling with Provence-Cycling-Holidays.com. Peter & Ann - Canada - May 14 - Provence bike tour review. Cycling heaven! For anyone who enjoys cycling, French cuisine, beautiful scenery and being sociable, this is an ideal place to book for a week or so. Ezza - Australia - Sept 13 - Provence bike tour review. I would recommend this trip to any cyclist. Stephen - US - Sept 11 - Provence bike tour review. "Hard to imagine a better vacation cycling in France..."
Peter & Frances - UK - Sept 10 - Provence bike tour review. "Fantastic! A haven for cyclist Neil was extremely helpful in assisting us with route planning and pointing out many of the fabulous attractions of Provence." Janette & Uys - South Africa - July 09 - Provence bike tour review.